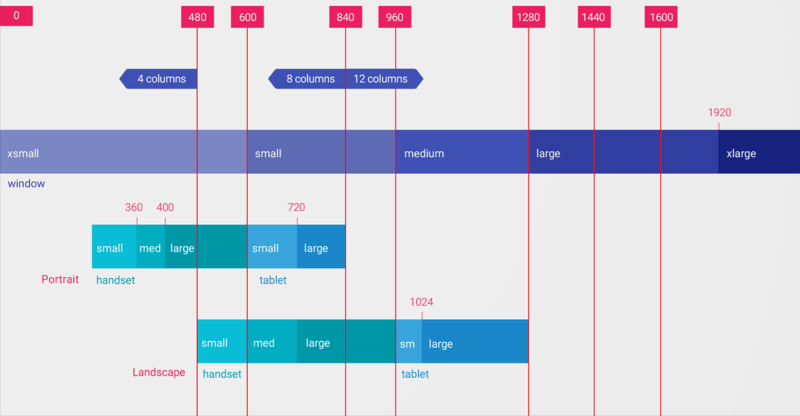 Android devices come in all shapes and sizes, so your app's layout needs to be flexible. That is, instead of defining your layout with rigid dimensions that assume a certain screen size and aspect ratio, your layout should gracefully respond to different screen sizes and orientations. By supporting as many screens as possible, your app can be made available to the greatest number of users with different devices, using a single APK. Additionally, making your app flexible for different screen sizes ensures that your app can handle window configuration changes on the device, such as when the user enables multi-window mode. But be aware that adapting to different screen sizes doesn't necessarily make your app compatible with all Android form factors. You should take additional steps to support Android Wear, TV, Auto, and Chrome OS devices. For design guidelines for building UI for different screens, see the material guidelines for responsive UI. No matter what hardware profile you want to support first, you need to create a layout that is responsive to even small variations in screen size. The best way to create a responsive layout for different screen sizes is to use ConstraintLayout as the base layout in your UI. ConstraintLayout allows you to specify the position and size for each view according to spatial relationships with other views in the layout. This way, all the views can move and stretch together as the screen size changes. 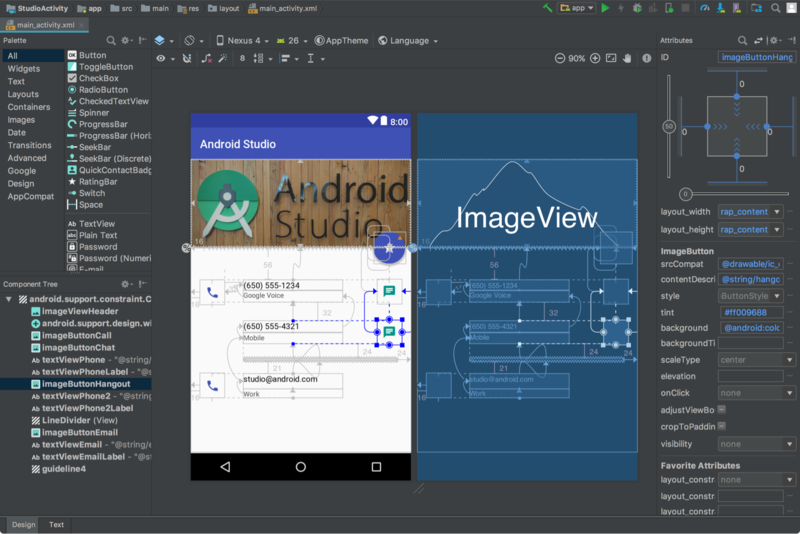 The easiest way to build a layout with ConstraintLayout is to use the Layout Editor in Android Studio. It allows you to drag new views to the layout, attach their constraints to the parent view and other sibling views, and edit the view's properties, all without editing any XML by hand (see figure 1). For more information, see Build a Responsive UI With ConstraintLayout. But ConstraintLayout won't solve every layout scenario (especially for dynamically-loaded lists, for which you should use RecyclerView), but no matter what layout you use, you should always avoid hard-coding layout sizes (see the next section). To ensure that your layout is flexible and adapts to different screen sizes, you should use "wrap_content" and "match_parent" for the width and height of most view components, instead of hard-coded sizes. "wrap_content" tells the view to set its size to whatever is necessary to fit the content within that view. "match_parent" makes the view expand to as much as possible within the parent view. Although the actual layout for this view depends on other attributes in its parent view and any sibling views, this TextView intends to set its width to fill all available space (match_parent) and set its height to exactly as much space is required by the length of the text (wrap_content). This allows the view to adapt to different screen sizes and different lengths of text. Figure 2 shows how the width of the text view using "match_parent" adjusts as the screen width changes with device orientation. If you're using a LinearLayout, you can also expand the child views with layout weight so that each view fills the remaining space proportional to their weight value. However, using weights in a nested LinearLayout requires the system to perform multiple layout passes to determine the size for each view, slowing your UI performance. Fortunately, ConstraintLayout can achieve nearly all layouts possible with LinearLayout without the performance impacts, so you should try converting your layout to ConstraintLayout. Then, you can define weighted layouts with constraint chains. Note: When using ConstraintLayout, you should not use match_parent. Instead, set the dimension to 0dp to enable a special behavior called "match constraints," which is generally the same as what you expect from match_parent. For more information, see how to adjust the view size in ConstraintLayout. Although your layout should always respond to different screen sizes by stretching the space within and around its views, that might not provide the best user experience for every screen size. For example, the UI you designed for a phone, probably doesn't offer a good experience on a tablet. Therefore, your app should also provide alternative layout resources to optimize the UI design for certain screen sizes. You can provide screen-specific layouts by creating additional res/layout/ directories—one for each screen configuration that requires a different layout—and then append a screen configuration qualifier to the layout directory name (such as layout-w600dp for screens that have 600dp of available width). These configuration qualifiers represent the visible screen space available for your app UI. The system takes into account any system decorations (such as the navigation bar) and window configuration changes (such as when the user enables multi-window mode) when selecting the layout from your app. Open your default layout and then click Orientation for Preview in the toolbar. In the drop-down list, click to create a suggested variant such as Create Landscape Variant or click Create Other. This creates a duplicate layout file in the appropriate layout directory so you can begin customizing the layout for that screen variant. 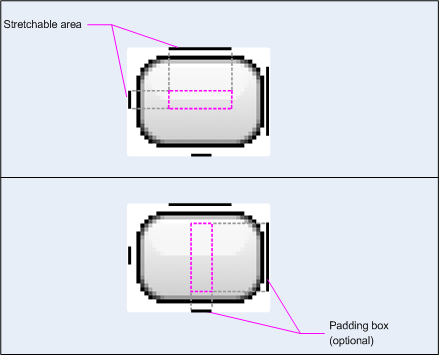 The "smallest width" screen size qualifier allows you to provide alternative layouts for screens that have a minimum width measured in density-independent pixels(dp or dip). By describing the screen size as a measure of density-independent pixels, Android allows you to create layouts that are designed for very specific screen dimensions while avoiding any concerns you might have about different pixel densities. The smallest width qualifier specifies the smallest of the screen's two sides, regardless of the device's current orientation, so it's a simple way to specify the overall screen size available for your layout. 480dp: a large phone screen ~5" (480x800 mdpi). Figure 4 provides a more detailed view of how different screen dp widths generally correspond to different screen sizes and orientations. Remember that all the figures for the smallest width qualifier are density-independent pixels, because what matters is the amount of screen space available after the system accounts for pixel density (not the raw pixel resolution). Note: The sizes that you specify using these qualifiers are not the actual screen sizes. Rather, the sizes are for the width or height in dp units that are available to your activity's window. The Android system might use some of the screen for system UI (such as the system bar at the bottom of the screen or the status bar at the top), so some of the screen might not be available for your layout. If your app is used in multi-window mode then your app only has access to the size of that window. When the window is resized, it triggers a configuration change with the new window size so the system can select the appropriate layout file. Thus, the sizes you declare should be specifically about the sizes needed by your activity—the system accounts for any space used by system UI when declaring how much space it provides for your layout. If the available height is a concern for you, then you can do the same using the "available height" qualifier. For example, layout-h600dp for screens with at least 600dp of screen height. Although you may be able to support all size variations using only combinations of the "smallest width" and "available width" qualifiers, you might also want to change the user experience when the user switches between portrait and landscape orientations. For more information about all the screen configuration qualifiers, see table 2 in the guide to Providing Resources. When designing your app for multiple screen sizes you want to make sure you aren't needlessly duplicating your UI behavior across your activities. So you should use fragments to extract your UI logic into separate components. 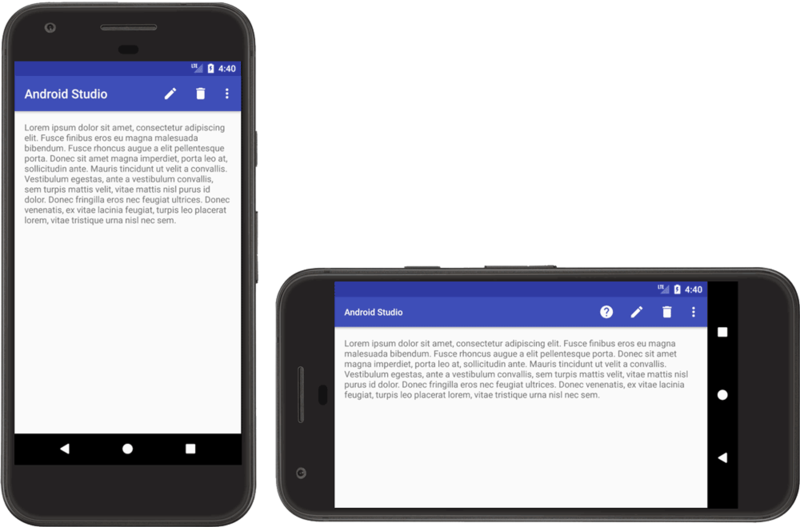 Then, you can then combine fragments to create multi-pane layouts when running on a large screen or place in separate activities when running on a handset. For example, a news app on a tablet might show a list of articles on the left side and a full article on the right side—selecting an article on the left updates the article view on the right. On a handset, however, these two components should appear on separate screens—selecting an article from a list changes the entire screen to show that article. To learn more, see Building a Dynamic UI with Fragments. If your app supports Android 3.1 (API level 12) or lower, you need to use the legacy size qualifiers in addition to the smallest/available width qualifiers from above. When supporting both pre- and post-3.2 Android versions you have to use both the smallest-width and large qualifiers for your layouts. So, you would have a file named res/layout-large/main.xml which might be identical to res/layout-sw600dp/main.xml. These two files have identical content, but they don’t actually define the layout. They merely set up main to be an alias to main_twopanes. Since these files have large and sw600dp selectors, they are applied to large screens regardless of Android version (pre-3.2 tablets and TVs match large, and post-3.2 will match sw600dp). If you use a bitmap as the background in a view that changes size, you will notice Android scales your images as the view grows or shrinks based on the size of the screen or content in the view. This often leads to visible blurring or other scaling artifacts. The solution is using nine-patch bitmaps, which are specially formatted PNG files that indicate which areas can and cannot be stretched. A nine-patch bitmap is basically a standard PNG file, but with an extra 1px border that indicates which pixels should be stretched (and with a .9.png extension instead of just .png). As shown in figure 5, the intersection between the black lines on the left and top edge is the area of the bitmap that can be stretched. Optionally, you can also define the safe region where content should go inside the view by similarly adding lines on the right and bottom edges. When you apply a nine-patch as the background to a view, the framework stretches the image correctly to accommodate the size of the button. For help creating a nine-patch image from a bitmap, see Create Resizable Bitmaps. It's important to test your app on a variety of screen sizes so you can ensure your UI scales correctly. If you don't have access to physical devices for all the different screen sizes, you can use the Android Emulator to emulate any screen size. If you would rather test on a physical device, but don't want to buy the devices, you can use Firebase Test Lab to access devices in a Google data center. If you decide that you don't want your app to run at certain screen sizes, you can set limits for you much your screen should resize or even restrict which devices can install your app based on their screen configuration. For more information, see Declare Restricted Screen Support.